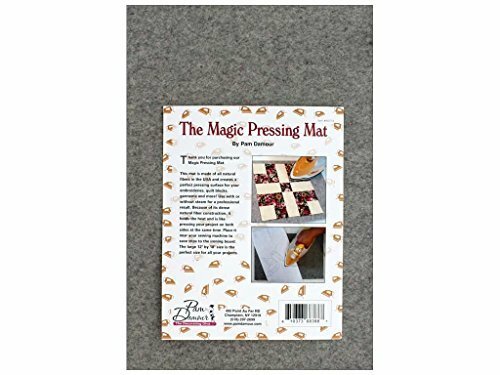 Pam Damour Notions Magic Pressing Mat 12"x 18"- The perfect pressing surface. Dense wool fibers trap the heat to press both sides at once. Make ironing easy for you and take cut half the time you usually spend ironing. Use with or without steam for professional results. Made of all natural fibers in the USA. The unique, high quality, and firm product allows this product to be the perfect product for those that must constantly iron their clothes. A great item for people who love sewing to the business professional who is preparing for an interview. 100% WOOL - Made in US and creates a perfect pressing surface for your embroideries, quilt blocks, garments, ect. HOLDS THE HEAT -We advise you to start at a lower heat due to the amount of heat the mats hold. PROFESIONAL RESULTS -Use with or without steam for results that make all results professional. If you have any questions about this product by Pam Damour The Decorating Diva, contact us by completing and submitting the form below. If you are looking for a specif part number, please include it with your message.